Under the direction of Byron Stripling, the Columbus Jazz Orchestra (CJO) is proud to celebrate the courage, dignity, and legacy of “the mother of the modern Civil Rights Movement,” Rosa Parks in “Suite Rosa”, this Friday and Saturday at the Lincoln Theatre. In connection with the 100th anniversary of her birth, this multi-disciplinary concert will recall the day in 1955 when Rosa Parks courageously refused to give up her seat on the bus, and, through modern and historical music and dance, celebrate the African-American story. Helping to tell this story are co-collaborators Alexis Wilson, choreographer, and John Clayton, composer. “Suite Rosa” is a first-time collaboration with Wilson, while a strong artistic relationship with Clayton continues. Mr. Clayton has also composed and guest conducted the 2005 CJO concerts “Art of the Big Band;” composed and conducted the world premiere of “The Colors of Jazz,” and served as consultant on its corresponding CD recording; guest conducted the 2007 CJO concerts “Miles Smiles” at the Southern Theatre; and composed the 2007 “Jazz Plays Art” commission centered on the work of Aminah Robinson. The re-interpretation of the seven-minute ballet, “Rosa,” originally choreographed by Billy Wilson, will be set and re-staged by daughter Alexis and performed for the first time with live music. The ballet consists of two female dancers (African-American and Caucasian) dramatically dancing the feelings and emotions of the famous bus conflict on December 1, 1955. As the song “I Told Jesus” plays the ballet crescendos to an electrifying close and the dancer portraying Rosa finally makes the decision to take a seat on the bus. Rosa does this without the thought of violence or bloodshed and uses her feminine energy to motivate the masses. The vision for incorporating African rhythms (spirituals and gospel) is to illustrate the progression of the African-American journey in America, with rap and hip-hop as the most recent leg of the journey. More importantly, that music provided the energy and enthusiasm to the Civil Rights Movement as it was sung and played constantly as a reminder that the struggle was guided by a divine spiritual force. The concert finale features a new commissioned work by John Clayton that will include the choreography of Alexis Wilson as the dancers and choir return to the stage for the final movement. In addition to the dancers and choir, the stirring finale will also include the spoken word poetry of Keith “SPEAK” Williams and the powerful vocals of Bobbi Townes (Fresh Wreckage). Single tickets are on sale now for $40 (loge)/$35 (orchestra) and available through the CAPA Ticket Office at 614-469-0939 and through all Ticketmaster outlets. Student and group rates are also available. For more information call 614-294-5200 or click here. The 40th anniversary season of the Jazz Arts Group is proudly presented by Grange Insurance. The Columbus Jazz Orchestra receives ongoing support from the Greater Columbus Arts Council, The Columbus Foundation, the Ohio Arts Council, and The Westin Columbus. 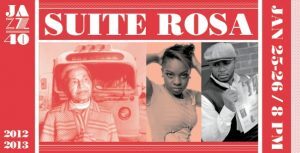 Concert sponsorship for “Suite Rosa” is provided by Cardinal Health, The Columbus Foundation, Crabbe, Brown & James, Larry James, Doug Kridler, David Meuse, and Rick Pfeiffer, with media support from The Columbus Dispatch, WOSU Public Media, and WCBE. Friday – Saturday 8:00 p.m.